In my blog dated 9th Nov 2014 I gave logical reasons why the Big Bang theory is not a credible model for explaining the origin of the universe. In this blog I will explain an alternative model, which I have named the Grand Interactive Model. This model not only logically explains the origin and evolution of the universe, but is also consistent with the concept of the inflationary period and the observation that CMB is uniform in all directions. Logic suggests that the source of all should be consistent with the concept of ‘Unity’. The black hole information paradox suggests that physical information could disappear in a black hole, allowing many physical states to evolve into exactly the same state. This suggests that complete unity exists inside a black hole. In other words, everything that is drawn into a black hole is transformed by its enormous internal forces into a ‘homogeneous essence’ or complete ‘unity’. Should this be the case, there is a strong logical argument to suggest that the black hole state is the source of all. 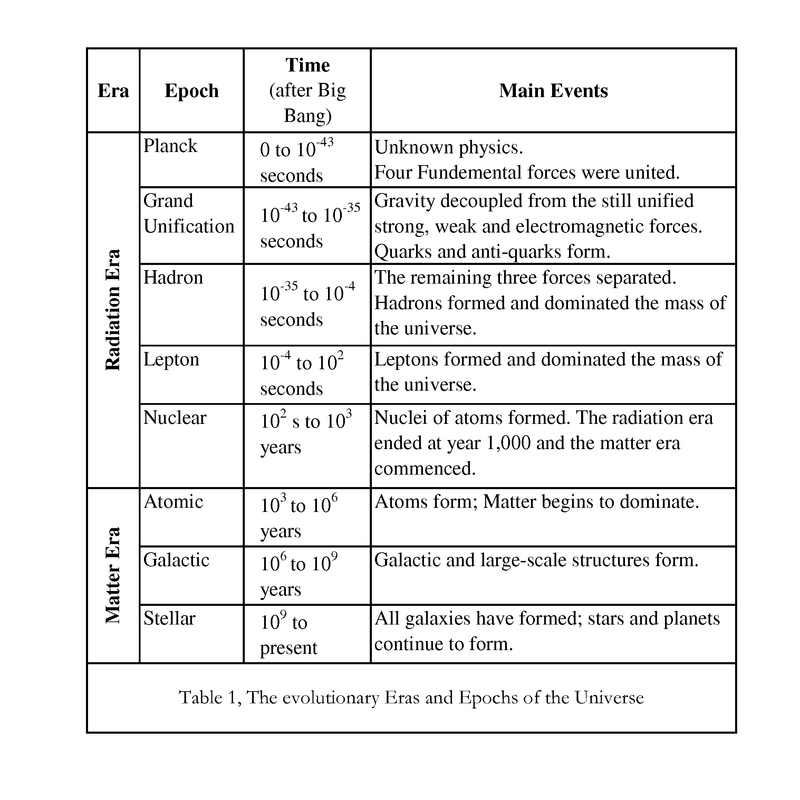 The evolution of the universe is frequently described in two eras and eight epochs, see Table 1. The physics of the Planck epoch is unknown. At the present time scientists posit that dark energy and dark matter make up 96% of the whole – even though they have no knowledge regarding their nature. However it is logical that these two phenomena preceded the existence of ordinary matter, since they form the major proportion of the whole. The Grand Interactive Model posits that dark matter and dark energy emerged from the black hole state in the Planck epoch. They then proceeded, with velocities much greater that the speed of light, to create all of space – since matter did not yet exist at that time, dark matter and dark energy could have expanded at ‘velocities approaching infinity’. In the Grand Unification epoch quarks formed from dark matter and gravity emerged as a fundamental force. The physical universe then evolved in accordance with scientific theory, with the formation of hadrons, leptons, nuclei of atoms, atoms, molecules, matter, galaxies, stars, planets, and moons – all the way up to the universe as we know it today. 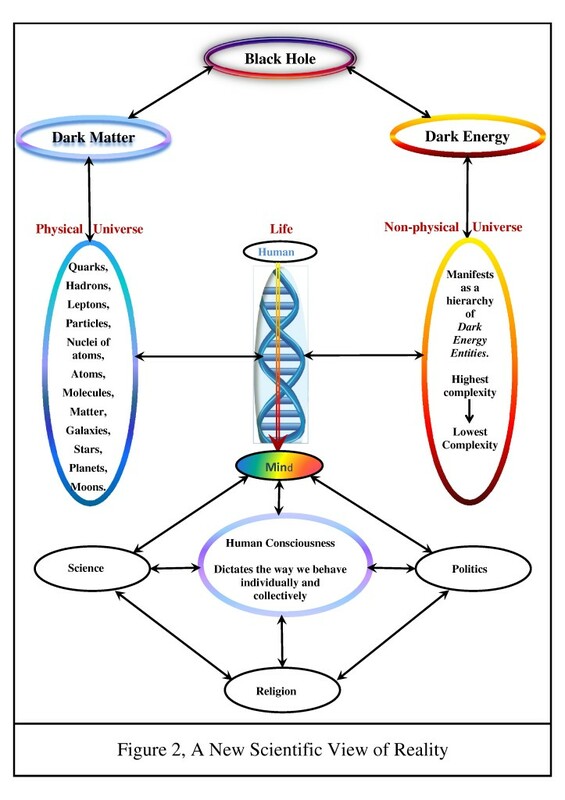 Physical entities, from quarks to planets, all emerged from dark matter; so it is logical to assume that dark energy entities emerged from dark energy and formed a non-physical universe in an analogous way. These non-physical entities are not observable or detectable by the science of the physical universe. When conditions allowed, matter and non-physical entities united to form life. 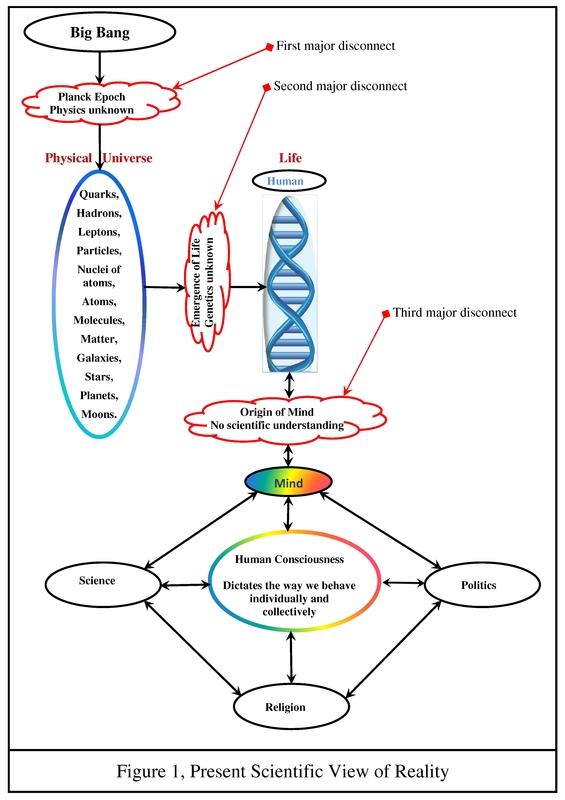 Life, mind, and human consciousness are therefore influenced by both the physical and non-physical aspects of life. The natural propensity of the physical aspect is towards lower complexity, as explained by the second law of thermodynamics and the concept of entropy; and the natural propensity of the non-physical is toward higher complexity. They are therefore the two forces keeping ‘tension’ on life, thus keeping it in existence, see my blog dated 12th Nov 2014. Figures 1 and 2 below represent the present and new views of reality which result from the Big Bang model and the Grand Interactive Model respectively. The source continues to interact with the ‘whole system’ continuously throughout its life, see my blog dated 9th Nov 2014. The source seems to be completely ‘used up’ in the act of creating the system and consequently there is no continuous interaction between the source and the system, see my blog dated 9th Nov 2014. There is no continuous cycle of emanation, manifestation and return throughout the life of the ‘whole system’. According to Alan Guth, a scientist at the Massachusetts Institute of Technology, the radius of the universe increased by 1030 times in only a fraction of a second, sometime around the Grand Unification epoch. The Grand Interactive Model suggests that dark matter and dark energy emerged in the Planck epoch. In these states velocities could have approached infinity since matter did not yet exist. Even in the Grand Unification epoch, when quarks emerged, velocities could have exceed the speed of light since matter had not yet started to ‘clump together’ – which only started in the Hadron epoch. Therefore the inflationary period could logically have occurred during the Planck and Grand Unification epochs and possibly the early Hadron epoch. During the Grand Unification epoch and the early part of the Hadron epoch, because matter had not yet started to ‘clump together’, particle velocities, and therefore temperatures, would have been extremely high throughout all of space, which explains the uniformity of CMB. In blogs over the coming months I will explain how the Grand Interactive Model provides logical explanations for many concepts in physics that are either counter-intuitive or not fully understood; for example quantum gravity, particle entanglement, wave particle duality, and many other concepts in quantum physics.